The Bisons dropped both games of a doubleheader against a hot Louisville team Tuesday night on the road by final scores of 3-0 and 4-3. In Game one, a pair of longballs provided the only runs of the contest for either side and in Game two, the Bisons fell in extra-innings after controlling a two-run lead. The Bisons were shutout in Game one of the twin bill. 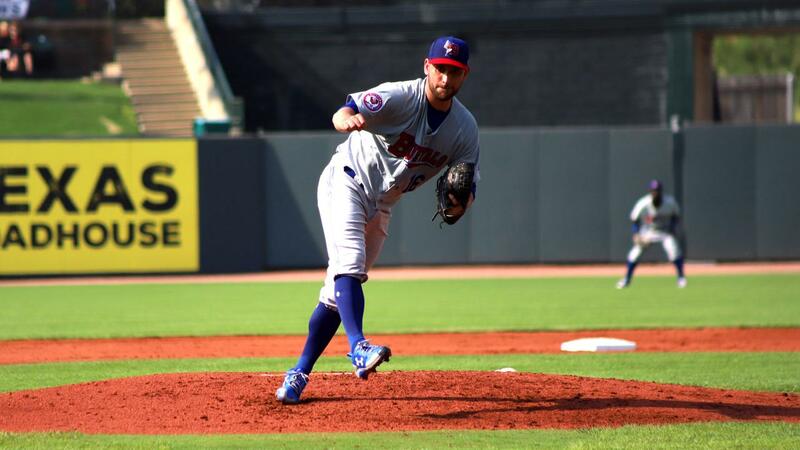 One frame proved to be the deciding factor as the Bats posted three runs in the third to deal a loss to Buffalo. Marco Estrada took the mound for the Herd in Game one, making a rehab start on his way back from suffering a left glute strain earlier this month. This was his first outing since July 3. Estrada didn't give up a hit in the first two innings, but the Bats seized a three-run lead on home runs from Josh VanMeter and Gabriel Guerrero in the third. Estrada was pulled from the game after 3.1 innings of work after appearing to have discomfort with a finger on his throwing hand. The right-hander struck out three batters in the start. Buffalo had a scoring chance in the fifth when Anthony Alford reached third base with one out, but he was erased from the base path on a successful pick-off throw from Bats' catcher Chadwick Tromp. After an appearance with the Bluefield Blue Jays and two outings with the Dunedin Blue Jays, closer Roberto Osuna pitched an inning in relief for the Bisons. He faced five hitters and worked around a two-on, two-out spot in the sixth by striking out Hernan Iribarren. The Herd was held to just two hits. Dalton Pompey beat out an infield single in the third and Alford hit a single to right field in the fifth. In Game two, the Bisons went into extras but lost on a go-ahead, RBI-groundout by Iribarren in the eighth. The speedy Jonathan Davis began the bottom of the eighth at second base, but the Herd couldn't bring him home as the tying run. The Bisons served as the home team in Game two because of a postponed game that was scheduled to be played between the two teams at Coca-Cola Field in April. The game was slow to start offensively as neither team recorded a hit until the bottom of the third when Tim Lopes squeaked a single past the infield. After Buffalo built up a two-run lead, the Bats struck for three runs in the sixth to take a 3-2. The advantage was secured on a two-run home run from Brian O'Grady. Lopes supplied an answer with a two-out double in the Bisons' half of the sixth to score Alford, who pinch ran for Gio Urshela. Lopes' base knock knotted the score at three runs apiece. The Bisons scored one run in each of the previous two innings thanks to a solo home run from Richard Urena to break the 0-0 tie and an RBI-double from Davis. Justin Shafer inherited a two one-out base runners in the top of the seventh and got out of the inning by inducing two fly outs.